The itinerary for this cruise was the best possible trip for everything that my mom and I wanted to see, from starting in Florida, which meant I got to stop by The Museum of Ice Cream in Miami, and then take a long relaxing vacation to end in my city, Los Angeles. With stops in beautiful countries, and a new continent, the pictures and experiences speak volumes to what a vacation can do for a person’s happiness. The first stop on our vacation after leaving Fort Lauderdale was Oranjestad, Aruba. The island is relaxing and a great escape in the Caribbean. The island has great beaches and colorful buildings to enjoy while taking a stroll through the little town. While we were in port here, I may have spent a lot of my time at the Starbucks finishing up work with clients and tending to my duties as public relations chair for my sorority. I promise this is the last stop that I let social media rule my day. Aside from embracing my true form as a millennial we embraced the beauty of the area by taking strolls around the town and taking in the stunning views of the ocean. When exploring by the ocean, I love a flowing floral maxi dress, shop my picks below. Our stop in Cartagena, Columbia was my favorite port, even if there was 90% humidity at 88°F. We took a bus tour around the city, and finished with a walking tour to explore all the intricacies of living in this beautiful city. The city is full of brightly colored buildings and elaborate doors, detailed with different style door knockers. In addition to all the stunning architecture, the old part of the city is filled with parks and tons of flowers hung from the terraces. As someone who is obsessed with architecture, I got it from my grandfather, visiting an old city like this was such a gift. When an all day adventure is combined with a beautiful location and high temperatures, the best option is comfortable shoes, like sneakers. With the background of the city being so vibrant in color, a casual neutral toned dress, white or black, is best to differentiate from the backdrop. I have linked some dresses below. Taking this cruise through the Panama Canal had always been a dream of my mothers. What was the most important to her was to sit at the front of the ship and watch as we sailed through the canal. Going on this trip, I didn’t think that I would care much about the actual process of the ship passing through, but I was wrong. It was so cool to watch the ship be moved up and down in the locks, watching how a huge ship can be moved just by the power of water. The Panama Canal was built as a way to make transit of things from the west to the east faster than it had ever been before. It’s something that I would tell anyone to put on their bucket list. On our way north we stopped in Puntarenas, Costa Rica to see the rain forests and see what wildlife the area has to offer. We stopped in a spot to see tons of parrots, we hiked through a little area of the jungle and saw many lizards, and we went on a boat tour to see the crocodiles. Costa Rica is 100% the place to visit if you’re up for an adventure, and for so many different nature views. The final stop on our adventure was to San Juan del Sur, Nicaragua. My mom and I enjoyed our excursions with Princess the most in this port. We traveled out to Lake Nicaragua and Granada. The tour of the lake was simply magnificent! All of the little islands are all unique in their own way, some have houses, some have hotels being built, and others are littered with wildlife, like some monkeys. While cruising around on the lake the views up to the volcano are worth the price of any fare to get there. Following our tour of the lake we headed to the town of Granada where we visited the town square and had a DELICIOUS lunch in a colonial restaurant. I would highly recommend this tour if you are ever on Princess and if you visit Granada you must find a lake tour for Lake Nicaragua. 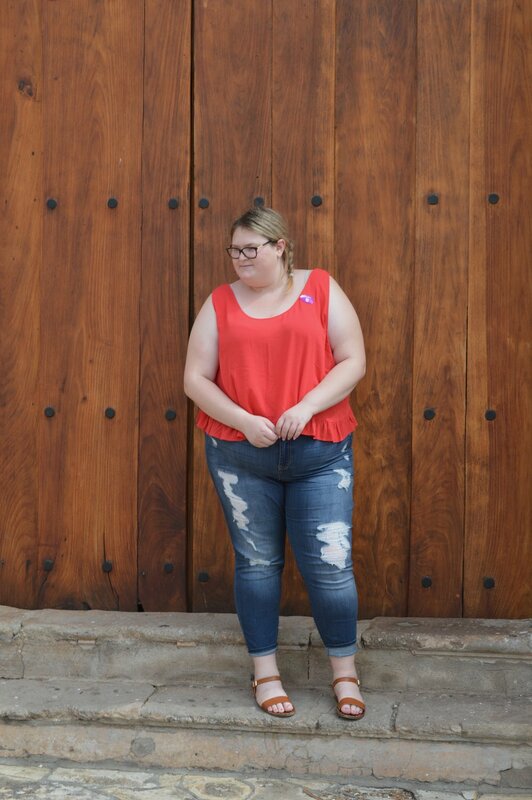 I wanted something that was going to be both comfortable and cute for an all day adventure, so I paired a bright crop top with ripped jeans, and my absolute favorite Steve Madden sandals. I’ve linked below a few great crop top options similar to the style of mine. Now that we have discussed the amazing locations that we visited on this trip, lets dive in to the amazing services and things to do on board! My favorite part of a Princess Cruise is that every cruise has a formal night, an excuse to get dressed up and take loads of beautiful pictures. The ship has a whole team of professional photographers to take stunning photos of just you, or turn it into a family affair with professional family portraits. While the ship is at sea, and you have a day of leisure there are so many things to do. The three things that I did most on board are; lounging by the pool, playing trivia multiple times a day, and getting a facial at the spa. Once the sun goes down, my family and I have dinner together in the dinning room, and often pick one night to go to the specialty restaurants. After dinner there is always something going on, whether it’s a performance in the princess theater, a comedy act, or a magician the night never has to end. This trip was such an amazing opportunity and I would recommend everyone visit Central and South American if you have the opportunity. I hope to keep traveling and sharing my adventures with all of you. I will soon be off to Australia and can’t wait to write all about it. Leave me a comment down below telling me where I should travel to after Australia to tell you all about it. I have traveled a lot with Princess and I have always loved traveling with them, but this post is in no way sponsored by them.